say it's the theory's predictions. 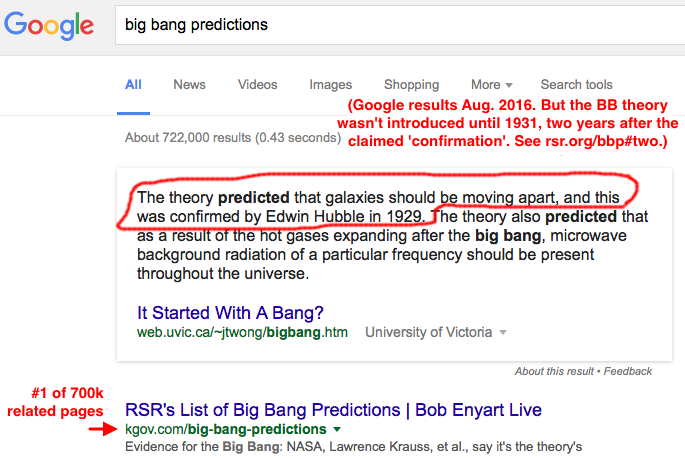 [Search for: big bang predictions. - the claimed predictions of initial abundances of the elements, hydrogen, helium, etc. - the failure of BB nucleosynthesis to account for most of the universe: dark matter, etc. - and dozens of other major failed predictions of the big bang. - the fractal distribution of matter throughout the universe apparently observed on all scales. - And from NASA and literally hundreds of relevantly degreed scientists, including many from leading institutions. 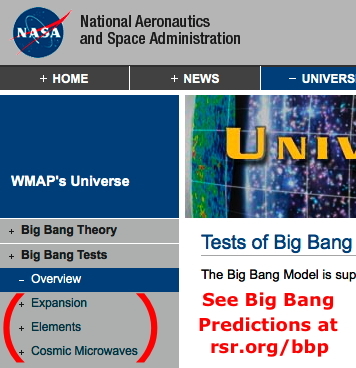 If this BB Predictions article and RSR's separate Evidence Against the Big Bang (video, article, and radio program) accurately present the contrary-to-interest expert testimony from leading proponents, then Lawrence Krauss (A Universe from Nothing, p. 18, and on Real Science Radio) is wrong when he (along with NASA and ten thousand others) claims that confirmed predictions validate the big bang theory. * Failure of the Theory to Predict Dark Energy: Consider a theory on the origin of the Grand Canyon that failed to predict the big hole in the ground. Along those lines, consider that, although dark matter (allegedly 23%) and dark energy (allegedly 73%) are claimed to make up 96% of the entire universe, the big bang also failed to predict these. How accurate is a model that, according to its own advocates, missed 96% of the picture? Thus, in addition to its many other failed predictions (as we see below), the big bang's failure to predict nearly 100% of the alleged matter of the universe is in addition to its failed prediction of 100% of a universe-worth of antimatter. The point is not whether expansion is occurring or not, but that the big bang theory never predicted dark energy. However, problems multiply for even the theoretical underpinning of the existence of dark energy. For example, a reduction in galaxy surface brightness with distance from the Earth is a long-standing fundamental prediction of an expanding universe. Yet a 2014 physics journal paper reports that careful observations of the surface brightness of about a thousand galaxies contradict that expectation and instead directly match a static universe. Further, as published in the Astrophysical Journal in 2016, there is "significant disagreement", according to the authors, in the value of the "Hubble parameter", between the two methods used for calculating it, which number indicates the apparent expansion rate of the universe. While pondering that disagreement, consider the big bang's need to fine tune the "cosmological constant" to more than one part in 10 to the 120th. This is so very precise that if the entire universe had as much additional mass as exists in a single grain of sand, the whole cosmos would collapse upon itself. That is, if a big bang actually formed our universe, and if it created a miniscule additional amount of mass than it is claimed to have created, then no planets, stars, or galaxies could exist. Conversely, if the universe had less mass, by that same quantity, it would be expanding so rapidly that matter would never have coalesced to become planets, stars, and galaxies, and again, we would not exist. The many arguments against dark energy, etc., has led scientists from leading institutions such as the Max-Planck Institute for Astrophysics, Sheffield University, George Mason University, Jet Propulsion Laboratory at CalTech, Cambridge University, Lawrenceville Plasma Physics, Penn State, Cal State Fullerton, University of Virginia, European Southern Observatory, and scores of other prestigious institutions to sign a public statement that begins, "The big bang today relies on a growing number of hypothetical entities, things that we have never observed-- inflation, dark matter and dark energy are the most prominent examples. Without them, there would be a fatal contradiction between the observations made by astronomers and the predictions of the big bang theory. In no other field of physics would this continual recourse to new hypothetical objects be accepted as a way of bridging the gap between theory and observation. It would, at the least, raise serious questions about the validity of the underlying theory. But the big bang theory can't survive without these fudge factors." Now consider the standard model's track record regarding the CMB, with one of the very scientists who won the Nobel prize for its discovery attempting to dial back the credit given to the big bang for that discovery. The important [BB] prediction that the cosmic microwave background (CMB) exists, and has a blackbody spectrum with a temperature of about 5 degrees above absolute zero, was a by-product of this work [Alpher & Herman, working under and disagreeing with George Gamow]. The existence of the CMB radiation was first predicted by Ralph Alpher in 1948 in connection with his research on Big Bang Nucleosynthesis undertaken together with Robert Herman and George Gamow. ... According to the Big Bang theory, the frequency spectrum of the CMB should have this blackbody form. This was indeed measured with tremendous accuracy... The accurate measurement of its shape was another important test of the Big Bang theory. The prediction though was of what was already known to exist. 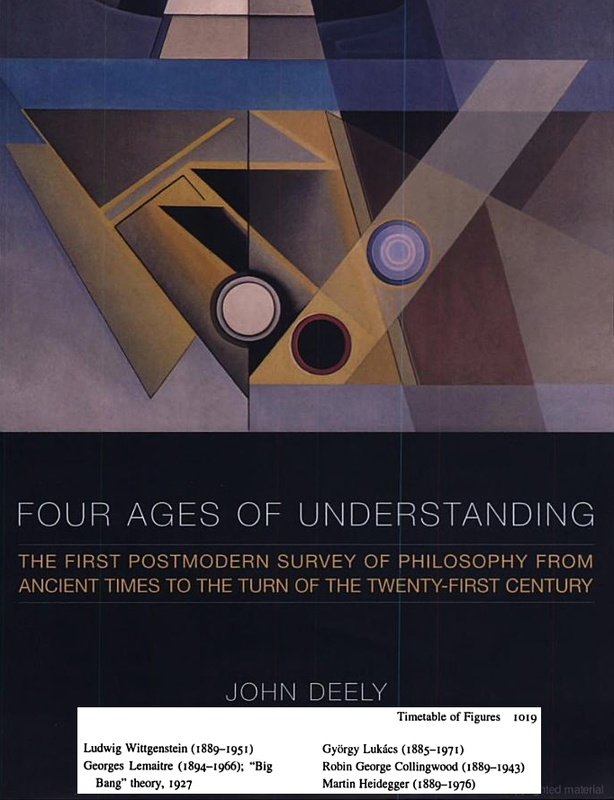 The theorists in 1948 were merely conforming the model to data already collected from 1937 to 1941. Then in the 1950s George Gamow, an early BB proponent and his students Alpher and Herman, made additional predictions of the CMB temperature that ranged from 3 to 50 degrees Kelvin. So even after the data from the Mount Wilson observatory reported a temperature very close to actual, leading theorists were making some predictions [or retrodictions] that were close to the actual temperature, and others that were off by a factor of more than 10 universes. - for the big bang to be considered experimentally confirmed. Of course, such predictions were logically constrained by absolute zero and by the expected frigid temperature of outer space, and then specifically by the work of Adams and McKellar. Yet with all that, the published 1948 prediction was still off by nearly a full universe margin of error. "What’s more, the big bang theory can boast of no quantitative predictions that have subsequently been validated by observation." 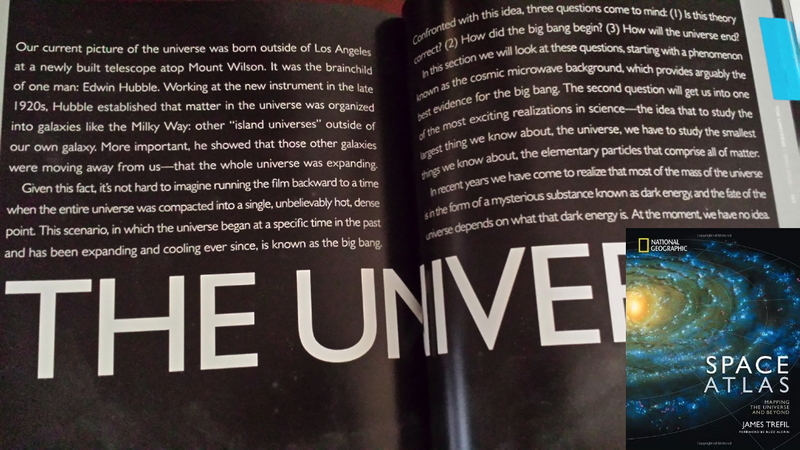 Eric Lerner et al., "Bucking the Big Bang", New Scientist, Vol. 182, 22 May 2004, p. 20. "The cosmic microwave background first showed itself observationally to astronomers in the late 1930s and early 1940s... 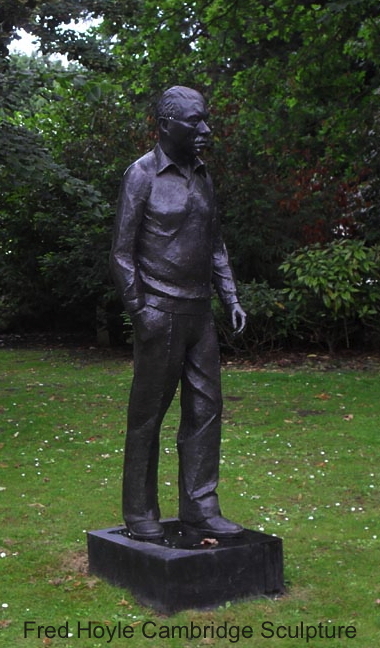 The excitating radiation was taken to be black body, and the temperature required for it, in order to explain the relative intensities of the observed lines, was 2.3 K."
"This detection of the microwave background was so very explicit that its discovery could quite properly be dated from 1941, if it suited astronomers to do so." The information explosion has brought about a concerted effort in the history of science to reevaluate the chronology of scientific discovery. The credit given to those traditionally recognized as discoverers is now often shared with other less well-known forerunners. This historically valuable trend is noticeably resisted where politically correct origins theories are involved, as with the big bang and evolution. (Darwinists for example either downplay or ignore the scientific contribution of intelligent design advocate Alfred Russell Wallace who wrote to Charles Darwin in 1858 outlining Wallace' theory of natural selection.) Regarding the big bang, the claim is too big to fail that it was confirmed by correctly predicting the CMB. So there we have it. RSR thanks the courageous scientists who resist politically correct historical revisionism and we also thank the creation movement and especially Dr. Walt Brown for the determination to hold the secular cosmologists' feet to the fire by exposing their unsubstantiated claims. Finally regarding the CMB, note that the BB did not enable scientists to predict the significant and generally aligned anisotropies found in the CMB from 2001 to 2013, which were so contrary to the expectations of the materialist origins camp that it is referred to as the cosmic 'axis of evil'; evil because it seems to point to the Earth as in a very special location. Of course this axis, along with the CMB's "cold spots" and other sophisticated and massive published observations highlight the big bang's failing foundational assumptions of homogeneity and isotropy. * Missing CMB Shadow of the Big Bang: As reported in Science Daily, University of Alabama at Huntsville scientist Dr. Richard Lieu concludes, "Either... the Big Bang is blown away or ... there is something else going on'." The Astrophysical Journal reported on a "vital test of the present cosmological paradigm" i.e., the big bang, that "taken at face value, one may even hold the opinion that there is in fact no strong evidence" for the long-predicted shadow of the CMB from behind 31 nearby galaxy clusters. As with dozens of some of the most careful and extensive observations ever made in the history of science, the missing shadow is yet another failure, not of an incidental off-the-cuff prediction but of a fundamental requirement of the big bang. As Dr. Lieu put it, "These shadows are a well-known thing that has been predicted for years. If you see a shadow… it means the radiation comes from behind the cluster. If you don’t see a shadow, then you have something of a problem." 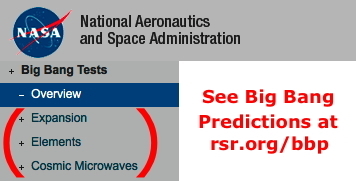 See also the Royal Astronomical Society's follow-up corroboration and hear RSR's 2014 discussion with one of the world's more successful physicists, at rsr.org/john-hartnett, that this hard data implies that the CMB may have a foreground source. Yet the BB remains a matter of deep faith among believers, as Dr. Lieu told space.com, "I myself am not at this point prepared to accept that the CMB is noncosmological and that there was no Big Bang. That would be doomsday." Prediction vs. Retrodiction. To avoid doomsday, the word "prediction" is widely misused in cosmology. An actual "prediction" is far different from a postdiction or a mere tweaking of a model to adjust it to meet existing requirements. A *prediction", if confirmed, lends credibility to a theory. Adjusting a model so that it conforms to observations does not confer that same credibility. So big bang promoters use doublespeak knowing that their claim of confirmed "predictions" will persuade many, whereas truthful statements that the model has been adjusted after the fact to conform to observations would be far less compelling. 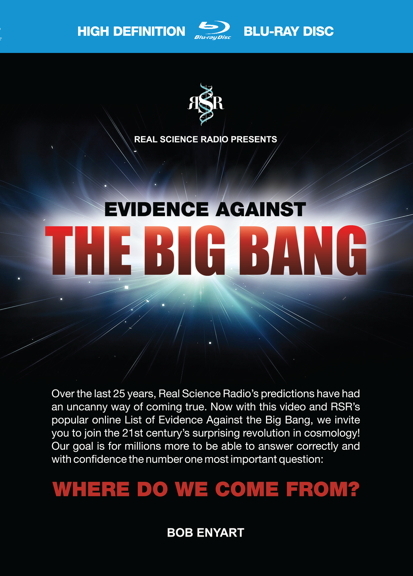 Part I: Evidence Against the Big Bang (from rsr.org/bb). 2015-2016 Update: The observations of gravity waves generated by the merger of black holes result from astronomers doing great science! As explained below, in 2014 the claimed detection of gravity waves generated by the big bang's alleged "inflation period" would have provided strong evidence in support of the big bang, if that evidence had been valid and had not been retracted. Contemporaneously, against broad celebration by scientists and throughout the science press, Real Science Radio hosts Bob Enyart and Fred Williams predicted on air that this "discovery" would not hold up. (Of course it didn't.) As for these more recent LIGO gravity wave detections, these say a lot about the universe including providing support for the speed of light remaining constant (and not decaying) since creation. However, unlike the case of gravity waves from an alleged inflationary period, these amazing detections of gravity waves from black hole mergers do not provide evidence in support for either the inflation period nor for the big bang itself. See this explained by RSR friend and award-winning astrophysicist Dr. John Hartnett. "I had thought that the [BICEP2] result was very secure," said Alan Guth, the cosmologist who first proposed the inflation concept in 1980... “Now the situation has changed,” added Guth, who works at the Massachusetts Institute of Technology in Cambridge. - Nat'l Geographic: Grand Cosmological Claim Crumbles? 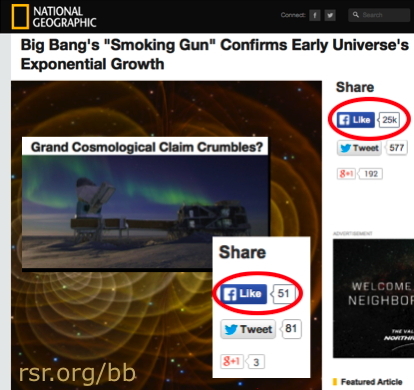 25,000 times the readers of National Geographic clicked "Like" to promote the alleged confirmation of the big bang's inflation period. But even many months after they reported the correction, only 51 of their readers similarly promoted the correction. The BICEP2 incident has also revealed a truth about inflationary theory. The common view is that it is a highly predictive theory. If that was the case and detection of gravitational waves was the 'smoking gun' proof of inflation, one would think that non-detection means that the theory fails. ... Yet some proponents of inflation... insist that the theory is equally valid whether or not gravitational waves are detected. How is this possible? ...inflation is [theoretically] driven by a hypothetical scalar field, the inflaton, which has properties that can be adjusted to produce effectively any outcome. ... No experiment can rule out a theory that allows for all possible outcomes. Hence, the paradigm of inflation is unfalsifiable. ...it is clear that the inflationary paradigm is fundamentally untestable, and hence scientifically meaningless. A cosmologist from the Perimeter Institute for Theoretical Physics in Waterloo, Ontario has a similar view. Neil Turok, who once bet Stephen Hawking that gravitational waves would never be detected, also says: "One of its problems is it’s very adjustable. [Inflation theory] makes very few specific predictions that you could actually go out and check with a measurement." And as with inflation, the entire Big Bang theory has a history of being wildly malleable. * Inflation Theory Not a BB Prediction But an Ad Hoc Secondary Assumption: Inflation was assumed to address the BB's starlight travel time problem. Like the starlight and time challenge put to biblical creationists, the big bang has the same problem, known as its horizon problem. Even a 14-billion year old universe is nowhere near old enough to enable the temperature of the background radiation to even out so perfectly. So, just as dark matter was not a prediction of the BB, in 1981, not as a prediction of the big bang, but in an ad hoc, adjusting to the data, dramatic secondary assumption, Alan Guth imagined an inflation period in which space expanded at speeds far greater than the speed of light, to solve the problem of a big bang universe being far too homogenous (even temperature) to be explained by the most fundamental of the laws of thermodynamics. So, in addition to inflation 2014 gravity wave fiasco as explained just above, the proposed wildly rapid and astoundingly brief expansion of space has no known mechanism that would power and suddenly start the expansion. Also unsolved is the "graceful exit" problem of an equally sudden stop. Yet while this inflation was proposed to account for the smoothness of the universe, apparently, it resulted in a far too smooth universe to enable the formation of stars and galaxies! Thus, as a dramatic offsetting counter assumption, cosmologists have begun proposing dark matter bubbles to get densities of matter in the midst of all that inflated homogeneity. That is, while inflation was imagined to address the problem of the universe being too homogenous, to solve the exact opposite problem, dark matter bubbles have now been imagined because the extreme evenness of background radiation indicates that the universe was not lumpy enough to naturally form stars. An expanding universe exacerbates the problem that the laws of physics do not enable the natural formation of stars from gas clouds. So BB cosmologists call again upon the super malleable great-in-a-pinch dark matter to rescue their theory. It is now claimed that trillions upon trillions of dark matter bubbles (DMBs) allegedly formed in a just-so arrangement by way of the big bang so that each one would gravitationally attract gas to form the trillions of alleged Population III protostars. With all those DMBs formed, this tertiary assumption/rescue device also solves the problem of how galaxies formed, suggesting that DMBs were initially arranged into clusters which formed the galaxies. Imagined inflation and DMBs are such dramatic attempts to explain observations which otherwise bluntly falsify the standard model, that one can see that the big bang theory is as pliable as any science fiction holodeck could be. * Alleged Confirmed Prediction of Abundances of Elements: While most cosmologists reject that God could have created the universe in six literal days, they themselves believe that within 20 minutes of the big bang, all of its matter had been created, via big bang nucleosynthesis (BBN). Then, approximately 13.772 billion years later, in the year 1946 A.D., George Gamow argued in Physical Review in his paper, Expanding Universe and the Origin of Elements, that all the chemical elements were produced in the first few seconds of the big bang. The stories of predictions based on big bang and stellar nucleosynthesis are intertwined, requiring unraveling to evaluate their merits. Gamow's proposal was quickly rejected. Think of the origin of the constituents of the periodic table. Only alleged predictions, or unreliable predictions, about their abundances can come come from a theory struggling even to account for the origin of elements (like carbon for example, see just below). Misrepresentating a theory's predictions, as this one's advocates do today, can tarnish what generally would be acceptable, the revising of a theory. Just two years later in 1948, Gamow, Alpher, and Hans Bethe, again in Physical Review in The Origin of Chemical Elements, proposed that the big bang produced only neutrons. Covering various possibilities, according to Steven Weinberg's 1977 book, The First Three Minutes, the next theories included one whereby the big bang produced only hydrogen. Observations [sic] of light elements abundances created during big bang nucleosynthesis (BBN) provided one of the earliest precision tests of cosmology and were critical in establishing the existence of a hot big bang. This observation applies to various predictions of the big bang (see above and below). Electromagnetic hurdles makes this already wildly insufficient timeframe even more problematic. Yet the vast majority of the science-reading, big-bang believing public undoubtedly assumes it has been shown that "we are star stuff" because the theory readily explains how "the elements in our bodies came from the stars." The reason though that Nature admits that carbon synthesis, "at a fundamental level remains unexplained" is because the imagined steps are wildly improbably, regardless of how much time is allotted. For 70 years now, the stellar nucleosynthesis theory has claimed that this highly improbably window of success that opens for less than a ten-millionth of a billionth of a second is somehow rapid enough to supply the entire universe, one atom at a time, with its carbon. The misrepresentations of the theory's predictions about elementary abundances (as this section will continue to document) are relatively insignificant compared to the observation that the big bang theory doesn't even actually have a working synthesis model that anyone can agree with. Carbon synthesis in stars, though it has a signficant effect also on "neon, oxygen, and silicon", as pointed out in that same issue of Nature in "Ab Initio Alpha—alpha scattering", has not been verified experimentally or computationally, yet believers express optimism that will change "in the near future." So claiming confirmation of predictions from a severely incomplete model lacks statistical confidence, to say the least. Explaining Uranium Isotope Ratios since 1952: Can something be both highly predictable and absurdly unpredictable? Yes. From two perspectives, from that of the real world, and from that of a failed theoretical model. Measure the ratio of uranium isotopes in a deposit in most any location in the world and you will get a highly predictable result. The big bang model, as the broad context for the submodel of the origin of the elements of the periodic table, could never, ever predict (or even explain in retrospect) the consistency of that ratio. Uranium's two most abundant isotopes have a highly predictable ratio with 235U/238U equaling 0.007257 with a standard deviation of only 0.000017. Big bang advocates claim that these isotopes formed in distant stellar cataclysms. Yet that these isotopes somehow collected in innumerable small ore bodies in a fixed ratio is absurd. The impossibility of the "big bang" explanation of the uniformity of the uranium ratio (rsr.org/bb#ratio) simultaneously contrasts in the most shocking way with its opposite impossibility of the missing uniform distribution of radioactivity (see rsr.org/bb#distribution) with 90% of Earth's radioactivity in the Earth's crust, actually, the continental crust, and even at that, preferentially near granite! A stellar-cataclysmic explanation within the big bang paradigm for the origin of uranium is completely falsified by these contrasting constraints. Initial Lithium Abundances Still a Mess: In 2012, in A Universe from Nothing, Lawrence Krauss references big bang "calculations that so beautifully explain the observed abundance of the light elements (hydrogen, helium, and lithium)", yet in 2014 two papers, in the Monthly Notices of the Royal Astronomical Society and in Physical Review Letters, report two extreme problems with the lithium prediction, with the lithium-6 prediction off by a thousand fold (see below) and all lithium isotopes showing a "discrepancy" from "BBN calculations" indicating that "the Li problem seems to be an universal problem, regardless of the parent galaxy" (see below). Missing 50% of Expected Hydrogen & Helium: This is also called the missing baryonic matter problem. Continuing in A Universe from Nothing, Krauss adds that, "The very same [big bang] calculations... also tell us more or less how many protons and neutrons, the stuff of normal matter, must exist in the universe.... Yet the initial density of protons and neutrons in the universe arising out of the Big Bang... accounts for about twice the amount of material we can see in stars and hot gas. Where are those particles?" So in addition to the missing anti-matter, there's also this missing matter. It's ironic therefore to hear the repeated claim that the big bang "beautifully" explains the initial abundances, except of course that half of even the predicted normal baryonic matter is missing. As NASA describes it, "when astronomers use a variety of independent observational techniques to measure what the density of our universe is, the numbers seem to come up short by a factor between two and five." Considering the mass of the universe, that's a lot of missing matter. And this is in addition to the dark matter that we haven't been able to find. This is the missing baryonic matter based on the big bang prediction. That is, compared to all the known mass of all the observable gas and stars in all the galaxies, there is that much mass, yet again, that is missing. Big bang proponents believe that all that matter is lurking out there somewhere. "It is easy to imagine ways to hide protons and neutrons", Krauss writes, in dark objects that don't shine. However his dilemma is exacerbated by the "transparency problem" (see below) and by NASA attributing this missing matter problem not to what we can't see but to what we CAN see! "The recent study of supernovae located some 5 billion light years away have, again, indicated that the universe seems to have about five times less density than inflationary cosmology demands that it must have to be consistent with the COBE measurements." Note that Krauss said the initial baryonic density of the universe has been determined by fitting to the observed abundances of the light elements. What does this mean? The theory of Big Bang nucleosynthesis contains a “free” or “undetermined” number called the “baryon-to-photon ratio,” indicated by the symbol nB. Photons are “particles” of electromagnetic radiation, and this ratio specifies the number of baryons compared to the number of photons in the Big Bang universe. Again, the theory itself does not actually specify [predict] the value of nB. Instead, nB may be chosen so that the abundances of hydrogen and helium that would have been produced in the Big Bang match those actually observed in nature—about 75 percent hydrogen and nearly 25 percent helium... These theoretical abundances match the observed abundances fairly well if one chooses nB so that there are roughly two billion photons per baryon in the universe. This assessment, written in 2013, describes the same circular confirmation as published in Nature in 1990 and in the Cosmology Statement in 2004. 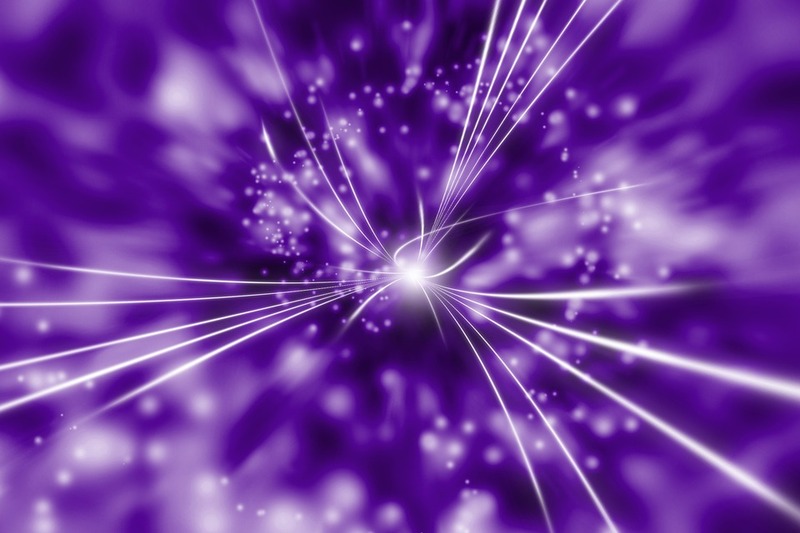 There are an estimated 413 photons per cubic centimeter in the universe. The baryon-to-photon ratio, previously thought to be about a billion to one, is now believed, in 2014 to be about 2 billion photons for each baryon, inferred from something called the angular power spectrum of the CMB. This is said to be in good agreement with the standard model. In an important paper in 2000, a baryon density was estimated that was some 50% higher than expected, yet that too was judged to be in "agreement with the basic inflation paradigm." The study of historical data shows that over the years predictions of the ratio of helium to hydrogen in a BB universe have been repeatedly adjusted to agree with the latest available estimates of that ratio as observed in the real universe. The estimated ratio is dependent on a ratio of baryons to photons (the baryon number) that has also been arbitrarily adjusted to agree with the currently established helium to hydrogen ratio. These appear to have not been predictions, but merely adjustments of theory (‘retrodictions’) to accommodate current data. * Problems with Abundances of the Next Two Light Elements: Regarding beryllium and boron, after those first 20 minutes of alleged BBN, then allegedly about 150 million years pass until the first stars begin to form. In the cores of the so-called Population III first generation of stars by way of stellar nucleosynthesis the other elements of the universe allegedly began to form, including beryllium and boron. Specifically, the rare and fragile light nuclei Lithium, Beryllium and Boron are not generated in the normal course of stellar nucleosynthesis (except 7Li) and are, in fact, destroyed in stellar interiors. "...no explanation for two light-weight elements—beryllium and boron—and the bulk of the lithium. “...it hasn’t been entirely clear where they came from,” notes Douglas K. Duncan, an astronomer at the University of Chicago and the Adler Planetarium & Astronomy Museum in Chicago... [Regardless though, cosmologists told a creation story for Be, B, and Li. However,] “what I was taught in graduate school..." can’t generate the three elements in the abundances observed today... [So as different quantities of these elements are observed, we'll just have to continue to change the theory.] Observations with the Hubble Space Telescope have only made matters worse. ...astronomers have for the first time measured the abundance of boron in eight stars [which allegedly] date from the formation of the Milky Way, some 10 billion years ago, and provide a record of boron abundance from that long-ago era. To the surprise of many astronomers, the Hubble studies show that the abundance of boron way back when wasn’t much lower than it is in the interstellar medium today. That finding is at odds with the notion that boron arose from the collision of high-speed protons with heavier elements. Ten billion years ago, “there wasn’t very much carbon, oxygen, and nitrogen in the galaxy, so there weren’t very many targets for the cosmic-ray protons to hit,” notes Duncan. ...but the new model accounts more fully for the elemental abundances... (Science News, Cowen). The BBN model predicts that lithium-6 should account for about two out of every 100,000 lithium nuclei in "metal-poor" stars, which are believed to be among the first stars to have formed and so should reflect the composition of the early universe. However, observations... suggest that the abundance of lithium-6 is more than a thousand times greater in such stars, accounting for about 5% of all the lithium present. This lithium-6 problem adds yet another piece of rsr.org/evidence-against-the-big-bang as Bob Enyart presented very delicately over at PhysicsForums.com. Yet while Johnston can honestly admit that "the amount of lithium-6 observed in today's universe is so different from the amount that theory predicts..." atheist Lawrence Krauss' still believes, contrary to reality, that "all evidence overwhelmingly supports the big bang." Mystery over apparent dearth of lithium 7 in universe deepens: ...there should be more lithium 7 than there appeared to be in the universe.... thus far no one has been able to come up with a reasonable explanation. And now, new research has deepened the mystery further by finding that the amount of lithium 7 in the path between us and a very young star aligns with would have been expected shortly after the Big Bang, but doesn't take into account the creation of new amounts since that time. In their paper published in the journal Nature, Christopher Howk and colleagues suggest the discrepancy is troubling because it can't be explained with normal astrophysics models. Regarding lithium-7, the 2013 paper, Standard Big-Bang Nucleosynthesis After Planck, begins with the canonical telling of the story that, "Big Bang nucleosynthesis (BBN) is one of the three historical strong evidences for the Big-Bang model together with the expansion of the Universe and the Cosmic Microwave Background radiation (CMB)." It continues, "Many studies have been devoted to the resolution of this so-called Lithium problem and many possible 'solutions', none fully satisfactory, have been proposed." And the authors conclude, "for lithium, as said above: the discrepancy remains of the order of 3. ... the modification of these [Planck cosmological] parameters in the range allowed cannot alleviate the lithium problem." ...is the Li problem a local problem, limited to our Galaxy, or is it independent of the environment? The analysis of the RGB stars in M54 confirms the findings in ? Centauri (Monaco et al. 2010), considered as the remnant of an accreted dwarf galaxy: the Li problem seems to be an universal problem, regardless of the parent galaxy. Real Science Radio is currently evaluating the March 2017 claims from Kyoto, Japan regarding this cosmological lithium problem and welcomes your input at Bob@rsr.org. Thank you. - Dark Matter: Astronomy texts that present a materialist story for the origin of the stuff of the universe, called big bang nucleosynthesis, present no accounting whatsoever for the origin of dark matter. However, a big bang universe requires the existence of five times more dark matter than all the normal matter that we actually observe filling the cosmos! Thus, it is grossly incorrect to claim that the big bang theory does a good job explaining the origin of the stuff of the universe. - Antimatter: Of course, as described above, big bang nucleosynthesis has also failed in one of its most fundamental predictions, that 50% of the "matter" of the universe would be antimatter. - Dark Energy: And because cosmologists admit that, like dark matter, they have no idea what dark energy might even consist of, therefore of course, neither the big bang theory itself nor its BBN hypothesis has in any way explained how dark energy could have formed. - Nature Admits: In 2016 by the world's leading science journal reported that: "In addition to the lack of antimatter, every list of the biggest mysteries in physics includes the natures of three things: dark energy, dark matter, and cosmic inflation. These three all posited as ad hoc solutions to problems posed by cosmological observations that do not fit predictions arising from [the big bang theory and] the general theory of relativity. Dark energy is needed to explain why the cosmic expansion in not slowing down; dark matter is invoked to resolve why galaxies are rotating too fast to be bound by gravity due to visible matter; and cosmic inflation is needed to explain [the horizon problem] how all parts of the Universe are the same temperature when the Big Bang occurred too quickly for everything to be causally connected (that is, regions of the visible Universe separated before light, and therefore temperature information, from one region could reach all other regions.)" * The Transparency Problem: Surprised astronomers are seeing objects that are apparently far more distant than any that they expected to be able to see. Scientists using NASA's FERMI telescope have recently exacerbated the "transparency problem" because, comparing observation to big bang predictions, there is a tremendous amount of missing "infrared light between galaxies", apparently, billions of years worth. According to New Scientist, this "may call into question our understanding of how galaxies are born", which of course was rather questionable already. :) As noted above, this transparency problem may exacerbate the problem of where to hide all the additional regular matter allegedly created in the big bang, the equivalent of "twice the amount of material we can see in stars and hot gas. Where are those particles?" Yes. Where? 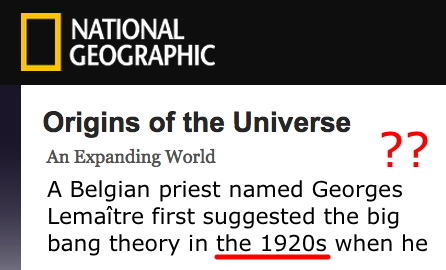 * Expansion Claim Post-Dated; Big Bang Theory Pre-Dated: Lemaître first proposed the big bang in 1931. Yet presumably reliable sources pre-date it as being proposed in the 1920s (see National Geographic and dozens of other sources, just below). Conversely, the proposal of an expanding universe is frequently post-dated and falsely claimed to have originated with Edwin Hubble. At RSR, we like to debunk conspiracy theories. These anachronisms form a canonical narrative. The revisionist big bang myth grew up as evidence for the theory. Proponents realize the persuasive value in their claim that the big bang theory actually predicted the expansion, the CMB, and the distribution of elements. However, simple links to the scientific papers from the 1920s and 30s (which links are typically absent from astronomy sites where one would expect them) easily restore the actual history. 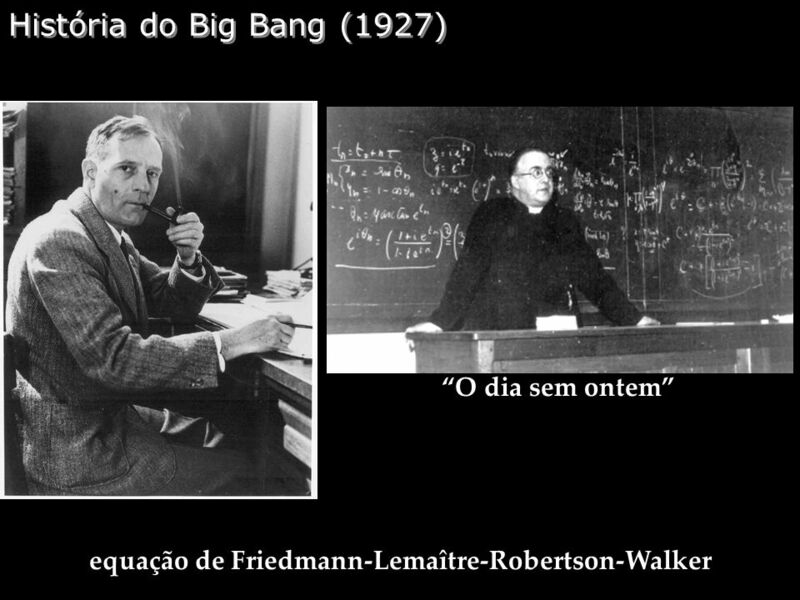 So, the true 1931 date of the big bang theory is not early enough for its story as commonly presented. 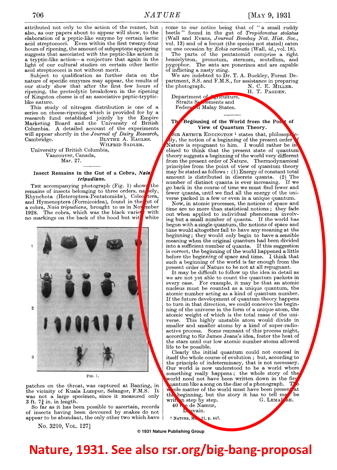 Yet it was the May 1931 issue of the journal Nature that first published Georges Lemaître’s brief letter, less than half-a-page (see right) titled, The Beginning of the World form the Point of View of Quantum Theory. 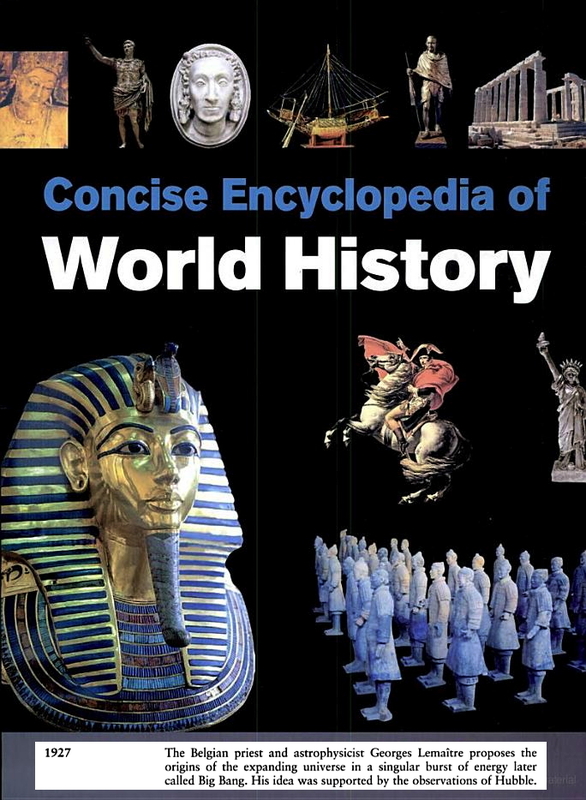 Can you spot the subtle revisionist errors in this brief encyclopedia entry that reinforces the false canonical story? Every problem looks like a nail to a boy with a hammer. So by the exciting new field of nuclear physics, Lemaître imagined the universe beginning by way of radioactive decay. (And he may have had Edgar Alan Poe's 1849 Erueka in the recesses of his mind.) And newly discovered over the previous 14 years was the nebulae redshift which could be interpreted, like Einstein's equations, as implying an expanding universe. Excitement over these new fields led Lemaître to propose some pretty wild ideas including the Big Decay origin of the universe. - NASA: "discovery by Hubble that the universe is expanding... 1929"
- space.com: "Hubble discovered the universe was... expanding"
- Nat'l Geo: "the work of one man... that the whole universe was expanding"
- Boston's PBS: "Hubble discovered that galaxies were moving away"
- Wikipedia: "Hubble's 1929 discovery that... galaxies... are moving away"
- BBC Horizon: With expansion Hubble made "the discovery of the century"
- astronomy.com: "astronomer Edwin Hubble, who first observed cosmic expansion in 1929"
- New Scientist: A "discovery by Hubble" showed that the universe was expanding. - Quantum World by Ken Ford: In the late 1920s, Hubble discovered that the universe was expanding. - 100 Greatest Science Discoveries: In 1926 Edwin Hubble discovered that the universe was expanding. - Brian Greene in the NY Times: In 1929... Hubble discovered that distant galaxies are all rushing away"
- Krauss 2016: "It was 1929, Hubble discovered that the universe is expanding"
Yet even secular science authorities have begun objecting to the systematic misattribution, and hence, post-dating, of the the claim of expansion. Expansion was not a "prediction" of the 1931 big bang theory; it was a 1920s interpretation of both Einstein's equations and red-shift data. The Corrected History of the Discovery of Expansion: On the entire Internet, the following is the most concise and reasonably comprehensive chronology of the discovery of the (apparent) expansion of the universe. - 1912 Vesto Slipher: The radial velocity of the Andromeda Nebula. - 1915 Slipher: "the average velocity of the spirals is about 25 times the average stellar velocity." - 1917 Willem de Sitter: "The lines in the spectra of very distant stars or nebulae must therefore be systematically displaced towards the red, giving rise to a spurious positive radial velocity" [earliest redshift cosmological hypothesis]. - 1918 Carl Wirtz [translation]: "...the system of spiral nebulae is drifting apart by a velocity of 656 km with respect to the momentary location of the solar system as the center." - 1922 Alexander Friedmann: On the curvature of space. [Unlike Einstein's (& Newton's) difficulty in explaining why the universe doesn't gravitationally implode, Friedmann made an interpretation of general relativity that indicated an expanding universe. Consider also from Ostriker & Milton, for Lemaître in "Belgium in 1925... Slipher's spectra established that the spiral nebulae are extragalactic and gave their velocities... What Lemaître sought were solutions to [Einstein's] field equations that would avoid "Einstein's static universe... and de Sitter's... empty" universe.... "both of those models were [valid] solutions to Einstein's equations..."
- 1926 Edwin Hubble: Extra-galactic Nebulae: "This contribution gives the results of a statistical investigation of 400 extragalactic nebulae for which Holetschek has determined total visual magnitudes." - 1929 Edwin Hubble: A relation between distance and radial velocity among extra-galactic nebulae, which paper included the "Hubble Law" [called that because Hubble failed to attribute it as Lemaître's Law]. This March 1931 paper can help clarify to the general public that a "big bang" origin of the universe from a singularity [or from Lemaître's single atom] had not yet been proposed. Eddington then goes on to present a few pages of musings on entropy and time and then estimates the fine-tuning of the physics of the universe as more unlikely than one chance in ten raised to the hundredth power. In that paragraph, he states, "Philosophically, the notion of a beginning of the present order of Nature is repugnant to me." Lemaître seized upon this statement in his very brief letter published two months later in the journal Nature proposing what became known as the big bang theory. - 1931 Georges Lemaître: big bang proposal in Nature. - Vesto Slipher's name doesn't appear in Hubble's 1929 paper though most of the radial velocities presented were his. - Hubble wrote to astronomer JH Reynolds asking him to refrain from publishing that which Hubble later published without reference to Reynolds. - The astronomy establishment, Nasa, et al., psychoanalyzes Lemaître and claims that he was humble and did not desire "establishing priority for his original discovery." So perhaps RSR could be forgiven for trying our own hand at psychoanalysis. Lemaître employed blatant attention-getting techniques, like using the name of one of his famous competitors in the opening sentence of his papers. 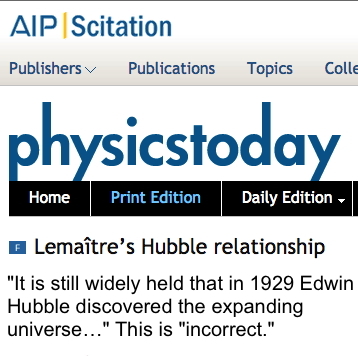 Then in a later paper, Lemaître himself claims credit for this discovery by directly pointing out: "The title of my note [1927 paper] leaves no doubt about my intentions..."
- Hubble and the astronomy establishment have allegedly been "cleared" from the charge of censorship, however, the Royal Astronomical Society invited Lemaître to translate for publication paragraphs 1 to 72 of his 1927 paper, with paragraph 73 containing his discovery of the "Hubble" Law. - Sidney van den Bergh of Canada's National Research Council writes at Cornell's arxiv.org that it is unclear who was responsible for the omission but he reports of the 1931 Monthly Notices "authorized translation of Lemaître's  discovery" that the "mention of the expansion of the Universe was omitted from the English version of both Eqn. [equation #] 24, and from the English text [and that this] suggests that this exclusion by the translator was deliberate..." However, that shocking and historic omission primarily benefitted Hubble and it was only one year earlier that Hubble himself was insisting that he be given full credit (regardless of the truth) for this discovery. "It is still widely held that in 1929 Edwin Hubble discovered the expanding Universe and that this discovery was based on his extended observations of redshifts in spiral nebulae. Both statements are incorrect. There is little excuse for this, since there exists sufficient well-supported evidence about the circumstances of the discovery. The circumstances have been well documented even recently with the publication of two books: Bartusiak (2010), Nussbaumer & Bieri (2009). Both were positively reviewed in the December 2009 issue of PHYSICS TODAY (page 51). Other writers have stated the facts correctly as well..."
- NASA: The "expanding universe, as predicted by the Big Bang theory." - The Exploritorium: "to support the Big Bang theory... observation [shows] that the universe is expanding." The Big Bang model was a natural outcome of Einstein's General Relativity... [That's misleading. The year after he published GR, Einstein added a constant to support his own view that a static universe had existed eternally. That constant can be arbitrarily valued as either positive, zero, or negative to obtain a repulsive, static, or attractive force that would tend toward expansion, a static, or a contracting universe.] However in 1917, the idea that the universe was expanding was thought to be absurd. [But by the time the BB was proposed in 1931, expansion was widely believed (see below).] So Einstein invented the cosmological constant as a term in his General Relativity theory that allowed for a static universe. [Notice how flexible this kind of cosmology is. The "success" of the big bang lies in its ability to simply conform to whatever the latest data or cosmological fad requires.] In 1929, Edwin Hubble announced that his observations of galaxies outside our own Milky Way showed that they were systematically moving away... [Statements like this reinforce the widely held falsehood that Hubble discovered expansion. As widely documented and shown below, published theoretical and observational considerations that pre-dated Hubble suggested that many galaxies are receding.] The universe was expanding after all, just as General Relativity originally predicted! [That's flat-out misinformation. GR can support a static, contracting, or expanding universe.] ... In other words, the Hubble law is just what one would expect for a homogeneous expanding universe, as predicted [retrodicted] by the Big Bang theory. [RSR plans to add a conclusion to this "expansion" section sometime in 2016. Please check back! It will begin with:] So can you spot the three misrepresentations in this high-profile Nasa claim that, "Edwin Hubble's 1929 observation that galaxies were generally receding from us provided the first clue that the Big Bang theory might be right." The hundreds secular astrophysicist, astronomer, and physicist signers at CosmologyStatement.org who reject the big bang's claimed successful predictions are matched by creationist scientists who also reject the big bang. Consider redshift, for example, atheist and creationist astrophysicists point out that the big bang theory had predicted galaxy formation at an extraordinary z = 100 redshift, which has been dramatically revised downward to z = 5 or less, by "observational necessity" from HST deep field images (Hoyle, et al., Williams and Hartnett). With all this wild flexibility, the big bang has led to anti-science, to the multiverse, and even to Boltzmann Brains. "It's hard to build models of inflation that don't lead to a multiverse," said Alan Guth. "But most models of inflation do lead to a multiverse, and evidence for inflation will be pushing us in the direction of taking [the idea of a] multiverse seriously." Once you posit an infinite number of universes, then atheists really run wild, as Luke Barnes over at space.com points out, describing, "a fully-formed brain spontaneously popping out of 'empty' space. Given enough time and space this vanishingly improbable event will occur. While such freak observers, known as Boltzmann Brains, would be massively outnumbered by biological observers in our universe [saints be praised], they could be common in the almost unending time and space of the entire multiverse." Thus, the big bang is rescued by the imagined inflation period, which leads to the science-killing multiverse, which makes it infinitely more likely that the universe doesn't exist and that the big bang never happened, and that you are merely a Boltzmann Brain floating alone in space with false memories. Really. 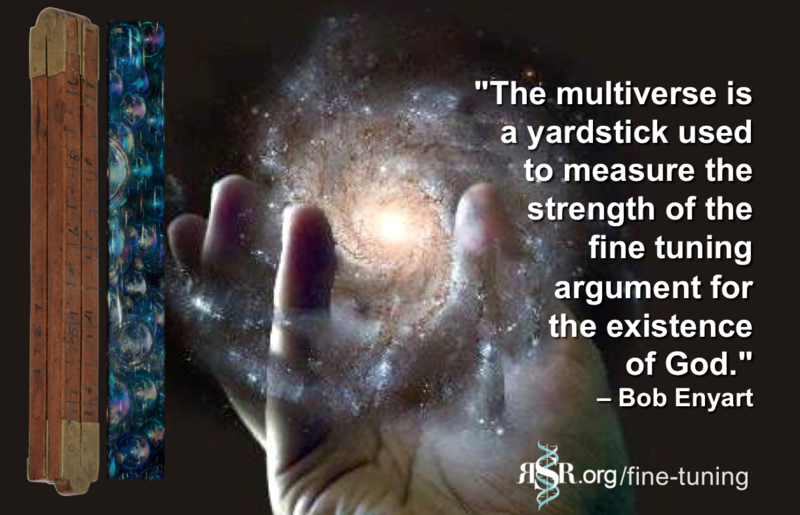 Research Questions: If you have an answer to one of these questions regarding the increasing observational evidence that contradicts the big bang's fundamental theoretical requirement of the Cosmological Principle, please consider emailing it to Bob@rsr.org. Thanks! - Is the deuterium/hydrogen ratio the same in different directions based on observation? - An initial study suggests that observations in one direction "need the universe to be comprised of 15% dark matter... But if you do the same [observation and calculation] in the opposite direction you need the universe to be comprised of 26% dark matter..." Have any other studies corroborated this finding? - the cosmological constant problem which Susskind called "the worst prediction ever"
Then, more broadly speaking, a relentless barrage of hard-science discoveries have falsified evolutionist predictions. Yet with the never-ending stream of secular scientists quoted as "shocked" by wildly unexpected discoveries that contradict their most fundamental suppositions, marketers like Lawrence Krauss typically pretend that no such pattern of falsified predictions exists. 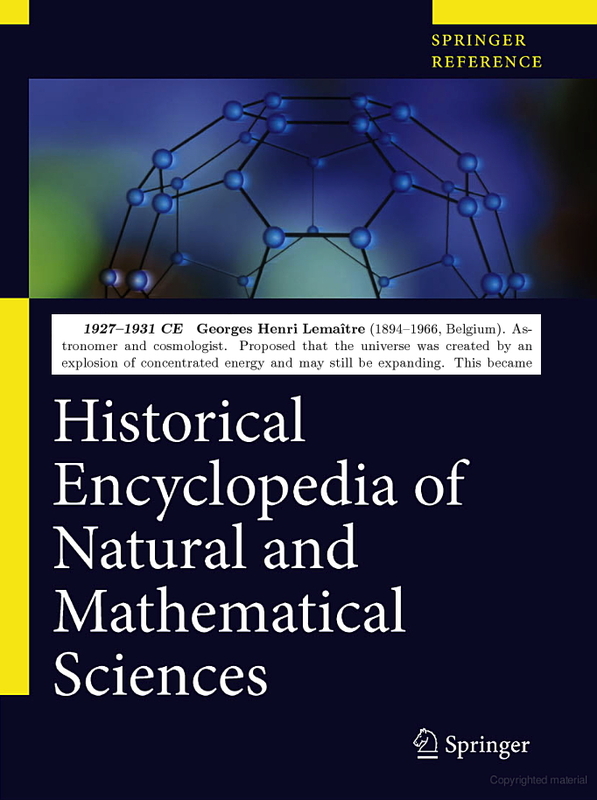 As with the discovery of hot Jupiters and the sequencing of the chimp's Y chromosome, a thousand times over, naturalistic scientists are baffled by what they find, which repeating pattern, of discovery and shock, discovery and shock, discovery and shock, is actually an ongoing experiment of prediction and falsification, of their claim of naturalistic origins. An open-minded evolutionist should be willing to re-evaluate his materialistic assumptions. "Rejection of a Creator is not a conclusion from science, but a bias forced onto science," observed Bob Enyart. * Get a Real Astronomy Resource: Get the Spike Psarris DVD What You Aren't Being Told About Astronomy and Vol. II, Our Created Stars and Galaxies! These are hands down the best astronomy videos ever made! You'll agree, or your money back! Also, purchasing them from us here at RSR will help us keep our radio show on the air reaching more and more people! And have you browsed through our Science Department in our KGOV Store? (That's what we call it.) Check out also Bob Enyart’s Age of the Earth Debate against a well-known geophysicist and a University of Colorado mathematician who are members of the Denver chapter of Reasons to Believe. And we asks you to consider getting a Bob Enyart Live monthly subscription, in audio or video, of one of our really fun and educational resources! 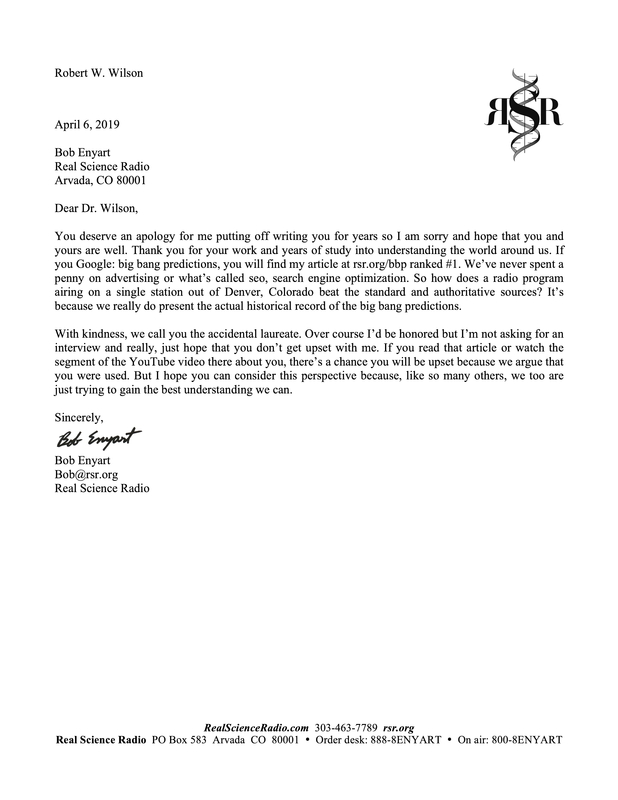 Finally, you might enjoy Part 2 of our Big Bang Predictions program and you may like to contrast the big bang theory's rather poor performance (see above) with Real Science Radio's fun and astonishingly successful rsr.org/creationist-predictions record!